A solution that has the properties of an acid (pH below 7). Acidic solutions typically have a strong sour taste. Activated carbon, sometimes called activated charcoal, is carbon processed to have small pores that increase the surface area for adsorption. It has a range of uses in the industrial, agricultural and medical fields as well as in drinking water filters. There are several different types including Powdered Activated Carbon, Granular Activated Carbon, and Extruded Activated Carbon. There are also different sources for this material including charcoal, coconut shells, and more. Learn more about activated carbon as a water filtration media. When a health effect is adverse it is considered to have a negative impact on the human body. 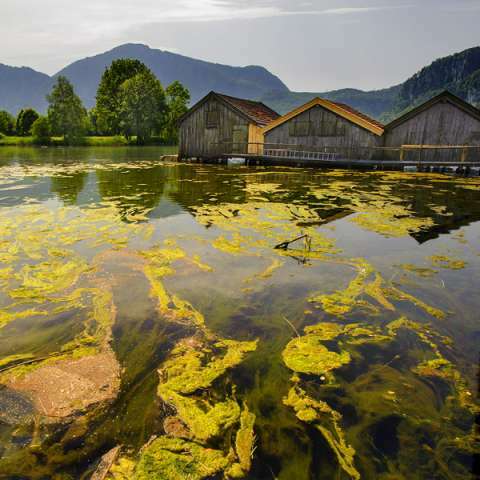 When an algae population grows rapidly, causing the water to be discolored, it is called an algal bloom. Some algal blooms produce toxins, while non-toxic blooms can be just as harmful. Harmful algal blooms are a major environmental problem in the US. Learn more about algal blooms. Alkaline water has a higher pH level than drinking water, meaning it’s less acidic than “pure” water. It can cause diarrhea and stomach upset, but is most notable for its very bitter taste. Ever wondered why the name “Sweetwater” pops up on the map so often in the Midwestern and Western United States? These areas were often those with good, balanced drinking water, as opposed to the alkaline water pioneers often ran into while trekking west. Learn more about alkaline water here. A conduit for conduction of water from a distance; an aqueduct usually employs gravity to transport water from one location to another. A body of water which lies beneath a layer of passable rock. The water may be fairly deep underground. In many places, especially arid regions, people depend on aquifers as a water supply, and are being rapidly depleted by the human population. Artesian water is water collected from an artesian well, which is an aquifer under hydrostatic pressure. Because of its positive pressure, artesian water rises to the surface itself when a hole is bored. These water deposits are often deep underground. Learn more about artesian water.